نادری, اعظم, فرزادکیا, مهدی. (1395). کارایی راکتورهای کرمی در کاهش حجم لجن تولیدی در سیستم‌های لجن فعال. مجله آب و فاضلاب, 27(6), 78-86. اعظم نادری; مهدی فرزادکیا. "کارایی راکتورهای کرمی در کاهش حجم لجن تولیدی در سیستم‌های لجن فعال". مجله آب و فاضلاب, 27, 6, 1395, 78-86. نادری, اعظم, فرزادکیا, مهدی. (1395). 'کارایی راکتورهای کرمی در کاهش حجم لجن تولیدی در سیستم‌های لجن فعال', مجله آب و فاضلاب, 27(6), pp. 78-86. نادری, اعظم, فرزادکیا, مهدی. کارایی راکتورهای کرمی در کاهش حجم لجن تولیدی در سیستم‌های لجن فعال. 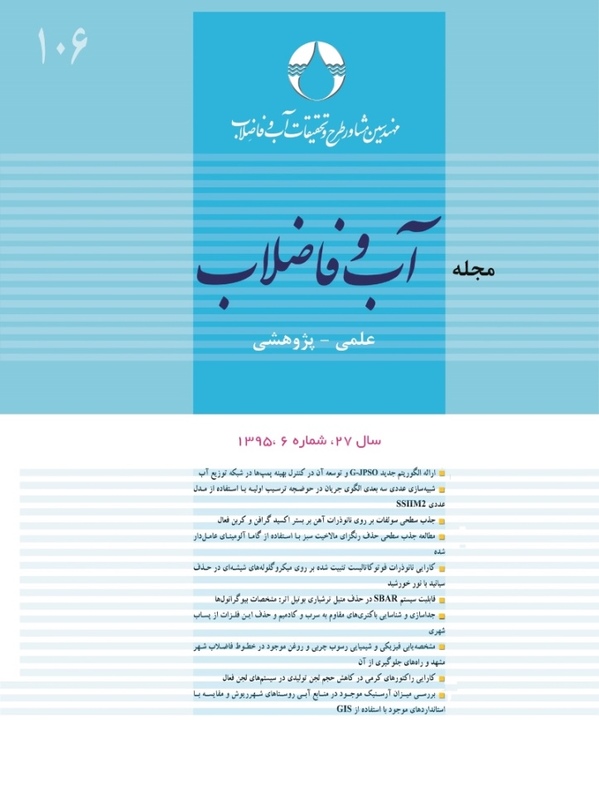 مجله آب و فاضلاب, 1395; 27(6): 78-86. از فرایند لجن فعال برای تصفیه بیولوژیکی فاضلاب‌های شهری و پساب‌های صنعتیبه‌طور گسترده‌ای در جهان استفاده می‌شود. یکی از مشکلات این فرایند، تولید بیش از اندازه لجن است. با توجه به قوانین سخت‌گیرانه محیطی در مورد دفع لجن مازاد، هزینه تصفیه و دفع لجن حدود 60 درصد از هزینه‌های بهره‌برداری تصفیه‌خانه‌ها را شامل می‌شود. از این رو طی سال‌های اخیر کمینه‌سازی تولید لجن در تصفیه بیولوژیکی فاضلاب مورد توجه قرار گرفته است. روش‌های متعدد فیزیکی، شیمیایی و مکانیکی برای بهبود کاهش لجن ارائه شده است. این روش‌ها در اغلب موارد نیاز به سرمایه‌گذاری بالا و هزینه‌های بالای بهره‌برداری دارند. فناوری استفاده از راکتورهای کرمی بسیاری از محدودیت‌های این روش‌ها را ندارد. در این مقاله ویژگی‌های این روش و پژوهش‌های انجام شده در این زمینه به‌صورت مروری مورد توجه قرار گرفت. The activated sludge process is the most widely used on a global scale for the biological treatment of both domestic and industrial effluents. One problem associated with the process, however, is the high volume of sludge produced. Excess sludge treatment and disposal account for up to 60% of the total operating costs of urban wastewater treatment plants due to the stringent environmental regulations on excess sludge disposal. These strict requirements have encouraged a growing interest over the last few years in reducing sludge volumes produced at biological treatment plants and a number of physical, chemical, and mechanical methods have been accordingly developed for this purpose. The proposed methods are disadvantaged due to their rather high investment and operation costs. An alternative technology that avoids many of these limitations is the worm reactor. In this study, the characteristics of this technology are investigated while the related literature is reviewed to derive the optimal conditions for the operation of this process in different situations. 1. Yan, P., Ji, F., Wang, J., Fan, J., Guan, W., and Chen, Q. (2013). “Pilot-scale test of an advanced, integrated wastewater treatment process with sludge reduction, inorganic solids separation, phosphorus recovery, and enhanced nutrient removal (SIPER).” J. Bioresource Technology, 142, 483-489. 2. Wang, Q., Ye, L., Jiang, G., and Yuan, Z. (2013). “A free nitrous acid (FNA)-based technology for reducing sludge production.” J. Water Research, 47, 3663-3672. 3. Pathak, A., Dastidar, M.G., and Sreekrishnan, T.R. (2009). “Bioleaching of heavy metals from sewage sludge: A review.” Journal of Environmental Management, 90, 2343-2353. 4. Maeda, T., Yoshimura, T., Shimazu, T., and Shirai, Y. (2009). “Enhanced production of lactic acid with reducing excess sludge by lactate fermentation.” Journal of Hazardous Materials, 168, 656-663. 5. Tyagi, V.K., and Lo, S-L. (2011). “Application of physico-chemical pretreatment methods to enhance the sludge disintegration and subsequent anaerobic digestion: An up to date review.” J. Rev. Environ. Sci. Biotechnol., 10, 215-242. 6. Liu, Y., and Tay, J-H. (2001). “Strategy for minimization of excess sludge production from the activated sludge process.” J. Biotechnology Advances, 19, 97-107. 7. Elissen, H.J.H., Mulder, W.J., Hendrickx, T.L.G., and Elbersen, H.W. (2010). “Aquatic worms grown on biosolids: Biomass composition and potential applications.” J. Bioresource Technology, 101, 804-811. 9. Jamal, A., Norieh, N., and Farzadkia, M. (2011). “Comparison of aerobic and lime stabilization methods for evaluation of sewage sludge reuse.” Journal of Environmental Science and Technology, 4 (2),182-190. 10. Farzadkia, M., Mirzaiee, R., Ghaffarkhani, M., and Bagheri, F. (2013). “Microbial quality assessment of disposal effluent and sludge from four decentralized wastewater.” Journal of Health in the Field, 1, 24-30. 11. Farzadkia, M., Jaafarzadeh, N., and Loveimi Asl, L. (2009). “Optimization of bacteriological quality of biosolids by lime addition.” Iranian Journal of Environmental Health Science and Engineering, 6 (1), 29-34. 13. Pilli, S., Bhunia, P., Yan, S., LeBlanc, R.J., Tyagi, R.D., and Surampalli, R.Y. (2011). “Ultrasonic pretreatment of sludge: A review.” J. Ultrasonics Sonochemistry, 18, 1-18. 15. Takdastan, A., Mehrdadi, N., and Azimi, A. A. (2009). “Investigation of the excess sludge reduction in SBR by oxidizing some sludge by ozone.” Iran. J. Chem. Chem. Eng., 28, 94-104. 17. Zhang, G., He, J., Zhang, P., and Zhang, J. (2009). “Ultrasonic reduction of excess sludge from activated sludge system II: Urban sewage treatment.” Journal of Hazardous Materials, 164,1105-1109. 18. Salsabil, M.R., Prorot, A., Casellas, M., and Dagot, C. (2009). “Pre-treatment of activated sludge: Effect of sonication on aerobic and anaerobic digestibility.” Chemical Engineering Journal., 148, 327-335. 19. Na, S-H., Shon, and H-K., and Kim, J-H. (2011). “Minimization of excess sludge and cryptic growth of microorganisms by alkaline treatment of activated sludge.” Korean J. Chem. Eng., 28, 164-169. 20. Hazrati, H., and Shaygan, J. (2011). “Review of sludge reduction methods in activated sludge systems.” Iranian Chemical Engineering Journal., 10, 67-75. 21. Khursheed, A., and Kazmi, A.A. (2011). “Retrospective of ecological approaches to excess sludge reduction.” J. Water Research., 45, 4287-4310. 22. Wang, J., Zhao, Q., JIN, W., and Lin, J. (2008). “Mechanism on minimization of excess sludge in oxic-settlinganaerobic (OSA) process.” J. Front. Environ. Sci. Engin. China , 2, 36-43. 23. Chen, G-H., An, K-J., Saby, Se., Brois, E., and Djafer, M. (2003). “Possible cause of excess sludge reduction in anoxic-settling-anaerobic activated sludge process (OSA process).” J. Water Research, 37, 3855-3866. 25. Foladori, P., Tamburini, S., and Bruni, L. (2010). “Bacteria permeabilisation and disruption caused by sludge reduction technologies evaluated by flow cytometry.” J. Water Research, 44, 4888-4899. 26. Wei, Y., Wang, Y., Guo, X., and Liu, J. (2009). “Sludge reduction potential of the activated sludge process by integrating an oligochaete reactor.” Journal of Hazardous Materials, 163, 87-91. 27. Gallard, H., and Von Gunten, U. (2002). “Chlorination of natural organic matter: Kinetics of chlorination and of THM formation.” J. Water Research, 36, 65-74. 28. Farooq, R., Rehman, F., Baig, S., and Sadique, M. (2009). “The effect of ultrasonic irradiation on the anaerobic digestion of activated sludge.” World Applied Sciences Journal, 6, 234-237. 30. Tian, Y., Li, Z., and Lu, Y. (2012). “Changes in characteristics of soluble microbial products and extracellular polymeric substances in membrane bioreactor coupled with worm reactor: Relation to membrane fouling.” J. Bioresource Technology, 122, 62-69. 31. Yang, J., Liu, J., Xing, M., Lu, Z., and Yan, Q. (2013). “Effect of earthworms on the biochemical characterization of biofilms in vermifiltration treatment of excess sludge.” J. Bioresource Technology, 143, 10-17. 32. Pe´rez-Elvira, S.I., Nieto Diez, P., and Fdz-Polanco, F. (2006). “Sludge minimisation technologies.” Reviews in Environmental Science and Bio/Technology, 5, 375-398. 33. Ghyoot, W., and Verstraete, W. (1999). “Reduced sludge production in a two-stage membrane-assisted bioreactor.” J. Wat. Res., 34, 205-215. 34. Lee, N., and Welander, T. (1996). “Use of protozoa and metazoa for decreasing sludge production in aerobic wastewater treatment.” J. Biotechnol. Lett., 18, 429-434. 35. Ratsak, C.H., Maarsen, K.A., and Kooijman, S.A.L.M. (1996). “Effects of protozoa on carbon mineralization in activated sludge.” J. Water Research , 30, 1-12. 36. Wei, Y., and Liu, J. (2006). “Sludge reduction with a novel combined worm-reactor.” J. Hydrobiologia, 564, 213-222. 37. Hait, S., and Tare, V. (2011). “Optimizing vermistabilization of waste activated sludge using vermicompost as bulking material.” J. Waste Management, 31, 502-511. 38. Zhao, L., Wang, Y., Yang, J., and Xing, M. (2010). “Earthworm–microorganism interactions: A strategy to stabilize domestic wastewater sludge.” J. Water Research, 44, 2572-2582. 40. Li, M., Nakhla, G., and Zhu, J. (2013). “Impact of worm predation on pseudo-steady-state of the circulating fluidized bed biofilm reactor.” J. Bioresource Technology, 128, 281-289. 41. Mosleh, Y.Y., Paris-Palacios, S.V., and Ahmed, M.T. (2007). “Effects of chitosan on oxidative stress and metallothioneins in aquatic worm tubifex (Oligochaeta, Tubificidae).” J. Chemosphere, 67,167-175. 42. Zhang, X., Tian, Y., Wang, Q., Chen, L., and Wang, X. (2012). “Heavy metal distribution and speciation during sludge reduction using aquatic worms.” J. Bioresource Technology, 126, 41-47. 43. Tamis, J., Van Schouwenburg, G., Kleerebezem, R., and van Loosdrecht, M.C.M. (2011). “ A full scale worm reactor for efficient sludge reduction by predation in a wastewater treatment plant.” Water Research, 45, 5916-5924. 44. Wang, Q., Wang, Z., Wu, Z., and Han, X. (2011). “Sludge reduction and process performance in a submerged membrane bioreactor with aquatic worms.” Chemical Engineering Journal ,172, 929-935. 45. Elissen, H.J.H., Hendrickx, T.L.G., Temmink, H., and Buisman, C.J.N. (2006). “A new reactor concept for sludge reduction using aquatic worms.” J. Water Research, 40, 3713-3718. 46. Lee, N., and Welander, T. (1996). “Reducing sludge production in aerobic wastewater treatment through manipulation of the ecosystem.” J. Water Research, 30,1781-1790. 48. Hendrickx, T.L.G., Temmink, H., Elissen, H., and Buisman, C.J.N. (2009). “Aquatic worms eating waste sludge in a continuous system.” J. Bioresource Technology, 100,4642-4648. 49. Hendrickx, TLG., Elissen, HHJ., Temmink, H., and Buisman, C.J.N. (2011). “Operation of an aquatic worm reactor suitable for sludge reduction at large scale.” J. Water Research, 45, 4923-4929. 50. Liang, P., Huang, X., Qian, Y., Wei, Y., and Ding, G. (2006). “Determination and comparison of sludge reduction rates caused by microfaunas predation.” J. Bioresource Technology, 97, 854-861. 51. Guo, W-Q., Yang, S-S., Xiang, W-S., Wang, X-J., and Ren, N-Q. (2013). “Minimization of excess sludge production by in-situ activated sludge treatment processes: A comprehensive review.” J. Biotechnology Advances , 31 (8), 1386-1396. 52. Ratsak, C.H. (2001). “Effects of Nais elinguis on the performance of an activated sludge plant.” J. Hydrobiologia, 463, 217-222. 53. Buys, B.R., Klapwijk, A., Elissen, H., and Rulkens, W.H. (2008). “Development of a test method to assess the sludge reduction potential of aquatic organisms in activated sludge.” J. Bioresource Technology., 99, 8360-8366. 54. Song, B., and Chen, X. (2009). “Effect of Aeolosoma hemprichi on excess activated sludge reduction.” Journal of Hazardous Materials, 162, 300-304. 55. Hendrickx, T.L.G., Temmink, H., and Elissen, H., and Buisman, C.J.N. (2010). “Aquatic worms eat sludge: Mass balances and processing of worm faeces.” Journal of Hazardous Materials ,177, 633-638. 56. Basim, Y., Farzadkia, M., Jaafarzadeh, N., and Hendrickx, T. (2012). “Sludge reduction by lumbriculus variegatus in Ahvas wastewater treatment plant.” Iranian Journal of Environmental Health Sciences and Engineering, 9 (4), 1-5. 57. Wang, Z., Yu, H., Ma, J., Zheng, X., and Wu, Z. (2013). “ Recent advances in membrane bio-technologies for sludge reduction and treatment.” J. Biotechnology Advances, 31 (8), 1187-1199. 58. Uan, D.K., Yeom, I.T., Arulazhagan, P., and Rajesh Banu, J. (2013). “Effects of sludge pretreatment on sludge reduction in a lab-scale anaerobic/anoxic/oxic system treating domestic wastewater.” J. Int. J. Environ. Sci. Technol., 10, 495-502. 60. Troiani, C., Eusebi, A.L., and Battistoni, P. (2011). “Excess sludge reduction by biological way: From experimental experience to a real full scale application.” J. Bioresource Technology, 102,10352-10358. 61. Tian, Y., and Lu, Y. (2010). “Simultaneous nitrification and denitrification process in a new Tubificidae-reactor for minimizing nutrient release during sludge reduction.” J. Water Research, 34,6031-6040. 62. Hendrickx, T.L.G., Temmink, H., Elissen, H.J.H., and Buisman, CJN. (2009). “The effect of operating conditions on aquatic worms eating waste sludge.” J. Water Research, 43, 943-950. 63. Liang, P., Huang, X., and Qian, Y. (2006). “Excess sludge reduction in activated sludge process through predation of Aeolosoma hemprichi.” J. Biochemical Engineering Journal, 28, 117-122. 65. Huang, X., Liang, P., and Qian, Y. (2007). “Excess sludge reduction induced by Tubifex tubifex in a recycled sludge reactor.” Journal of Biotechnology, 127, 443-451.